The popular Pride Mobility Victory 9 mobility scooter's convenient size makes this scooter an excellent entry-level full-size scooter. 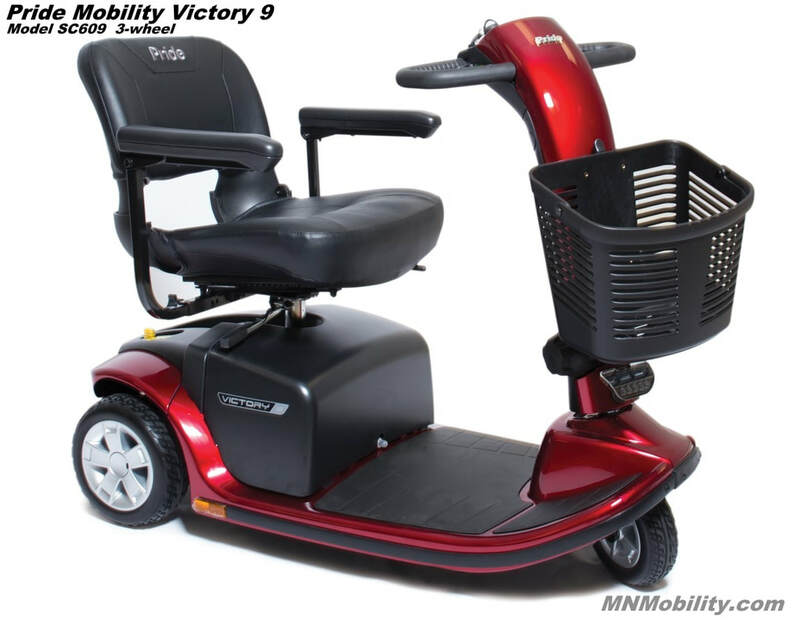 Not too big...not too small...the 3-wheel Victory 9 is nimble enough to use indoors, with only a 40.5 inch turning radius, yet sturdy enough to let you travel outdoors with confidence. 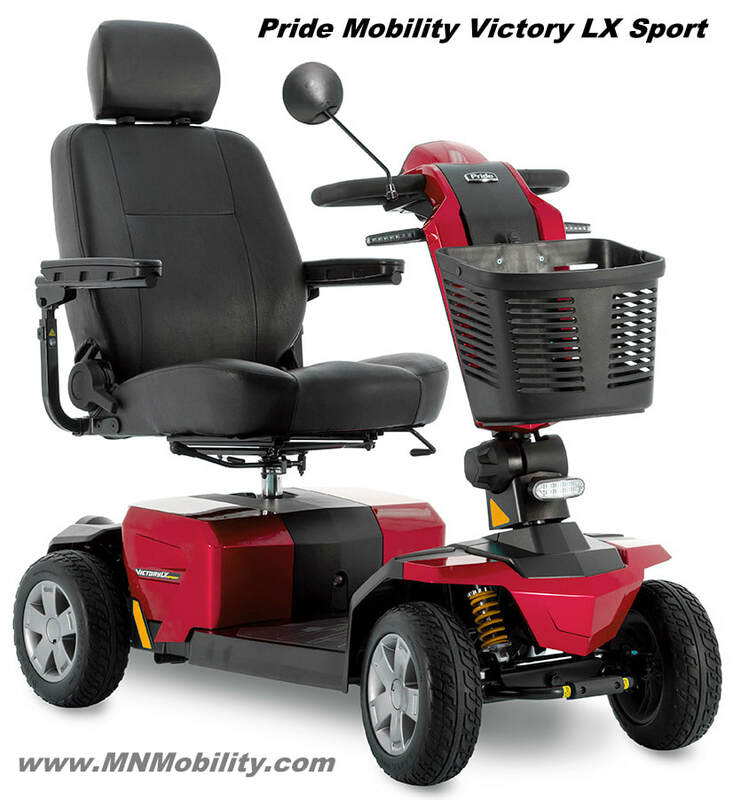 The 4-wheel victory 9 offers excellent outdoor stability on all types of terrain. Full size batteries give it a 13 mile per-charge range, and the charging port is located up on the tiller for easy access.and an impressive 300lbs. passenger weight capacity. 9" tires provide 2.25" of ground clearance. Featuring feather-touch disassembly, exclusive low-profile, non-scuffing tires, LED battery gauge and wraparound delta tiller. Seat swivels and slides fore and aft. Available in Candy Apple Red or Victory Blue. Top-speed: 5.25 MPH. Range: up-to 15.5 miles with upgraded 40 amp-hour batteries. Stadium style seat: 18"W x 17"D.
Model S6102 3-wheel: $1959.00IN STOCK! Model# S66 3-wheel: $1649.00 . 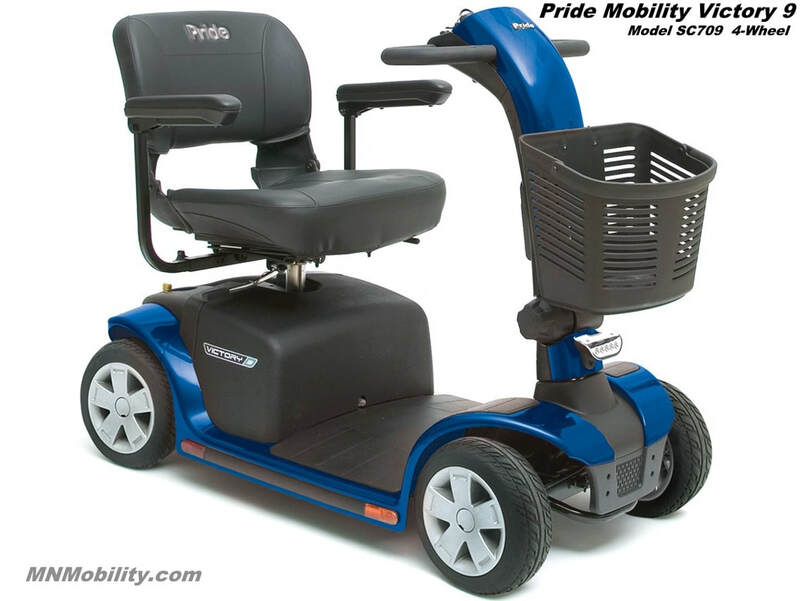 Model# S67 4-wheel: $1699.00 . Experience the Revo 2.0, a new class of scooter that combines an array of features into one great package. Tough and built to last, the Revo 2.0 offers rugged dependability you expect from luxury mid-size scooters. Comfort-Trac Suspension (CTS) ensures a smooth and comfortable ride over varied terrain. Experience convenient, feather-touch disassembly for portability. Enjoy standard under seat storage and speeds up to 5 mph. Heavy-duty passenger weight capacity of 375 lbs. Unique USB device charging port. Driving range of up-to 13-miles. 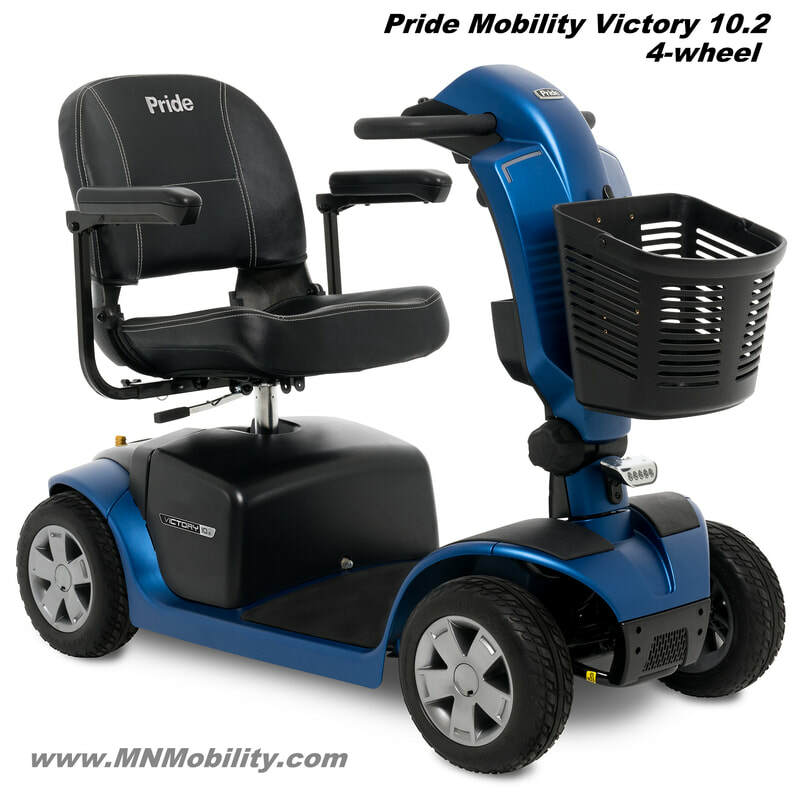 Pride Mobility Victory 10 LX CTS $1979.00 IN STOCK! 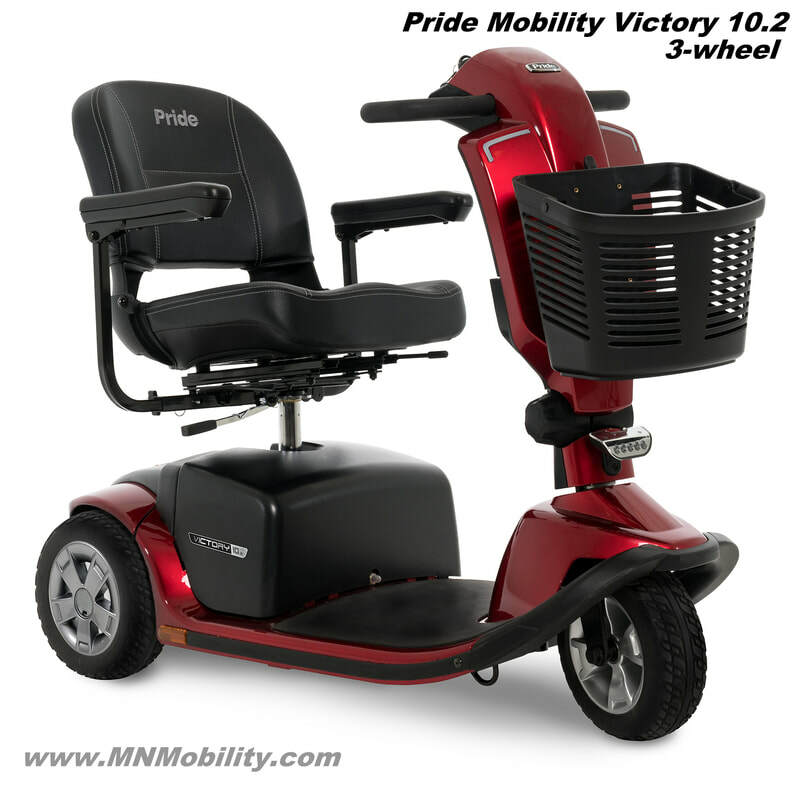 The newest in Pride’s Victory series, the Victory 10 LX with CTS Suspension, features a redesigned look and full front and rear suspension, providing a smooth ride both indoors and outdoors. The Victory 10 LX with CTS Suspension has the hallmark Victory Feather-Touch disassembly, allowing it to be quickly disassembled with one hand. 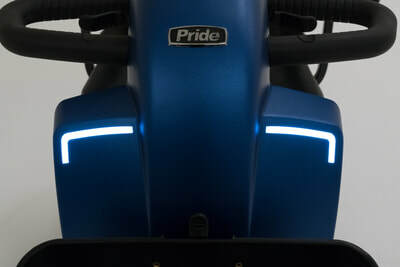 The Victory 10 LX with CTS Suspension features a full LED lighting package, with curb and rear lights, as well as turn signals. The Victory 10 LX with CTS Suspension is the first in the Victory series to feature Comfort-Trac front and rear independent suspension. This, along with the 10-inch solid, non-scuffing tires, allow for a smooth ride over indoor and outdoor terrain. The scooter’s 400-pound weight limit can accommodate more users. The Victory 10 LX with CTS Suspension is ideal for around-the-town use, whether it’s in your neighborhood or around the park. 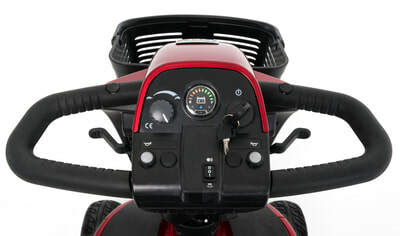 The scooter’s 47-inch deck is great for users over 6 feet, giving you more legroom. The delta tiller’s wraparound handles are easy-to-control and a good option for those with limited hand dexterity. Charging is made simple on the Victory 10 LX with CTS Suspension with an easy access charging port located on the tiller. The Victory 10 LX's ground clearance at the motor is 2.2 inches. The Pride Pursuit, model # SC713, is the big, heavy-duty mobility scooter that offers performance and supreme comfort. You can take this scooter off-pavement and the 13" wheels help provide over 3.5" of ground clearance. 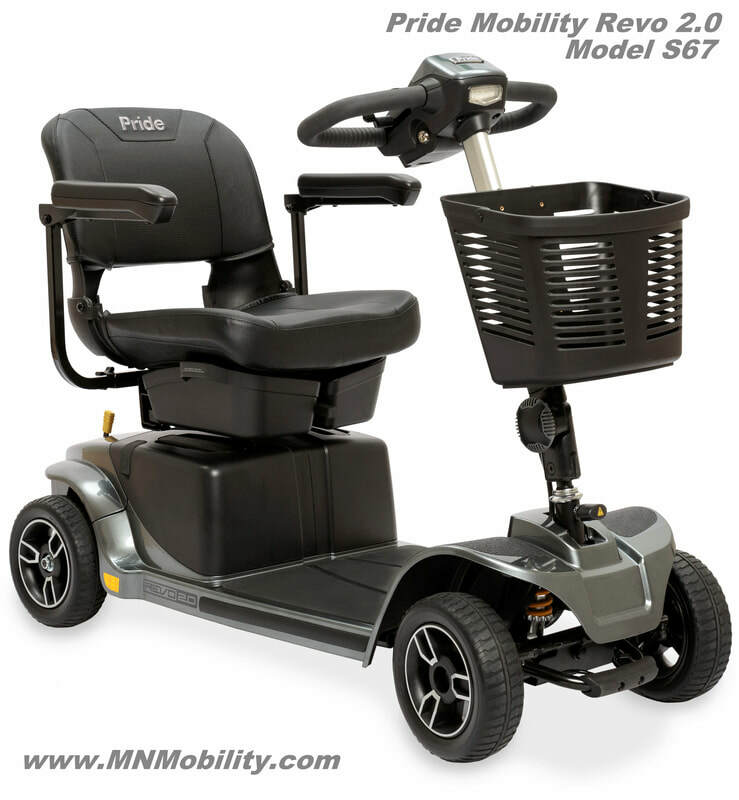 It has a 7.5 MPH top speed, standard full lighting package with directional signals and non-marking low profile tires. Easy to operate with the directional controls inside the comfort delta tiller handle. The Pursuit PMV offers independent front and rear dynamic suspension for smooth rides over bumpy terrain. 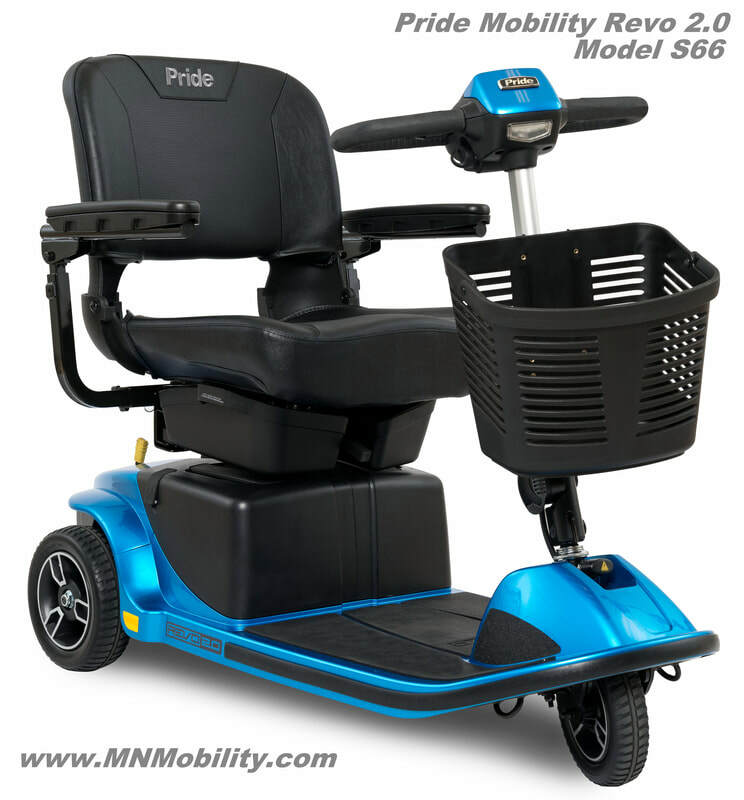 The 18"w x 18"d premium high-back captain's seat reclines, swivels, and slides back-and-forth. The pursuit disassembles with the heaviest piece weighing 95 pounds. Passenger weight capacity: 400lbs. Top-speed: 7.5 mph. Range: up-to 14 miles with 55 amp-hour batteries. Optional Group-24 (75 amp-hour) batteries are available for $240.00 for the pair. 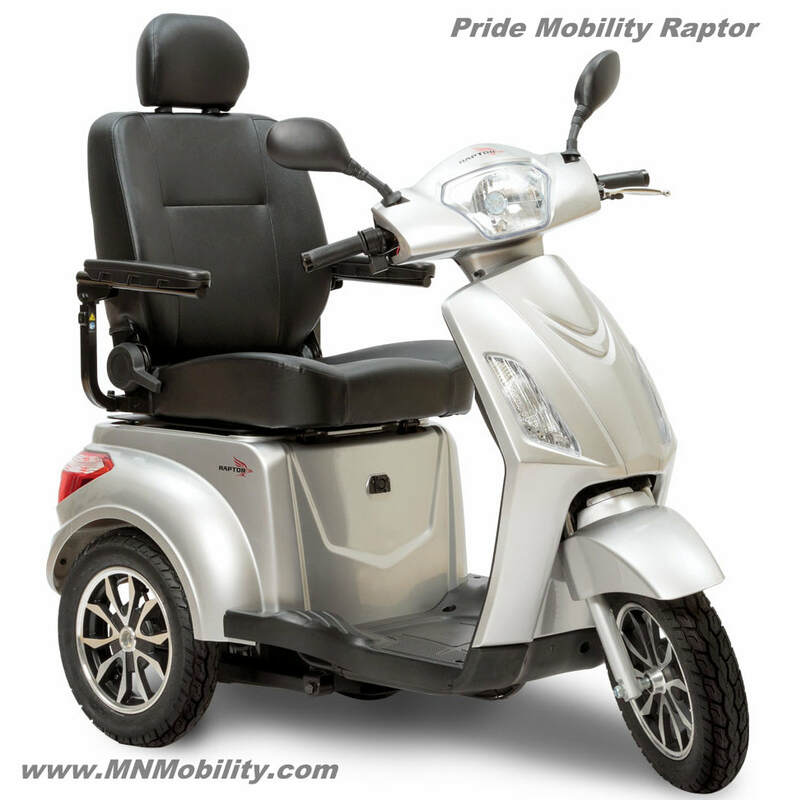 Pride Mobility Raptor $2499.00 .